I am happy to say that Bill and I are back in the Adirondacks! This trip has been an eye opener in many ways. After a knee injury set me back 9 months I have been happy to see that I am able to do hikes up to 4 hours with fairly steep inclines, and minimal scrambles. This may seem like nothing to most ADK hikers, but for me, it was a confidence builder that told me “I am not my knee injury” and I am back in step. With that said, being out for so long has given me a new perspective on where I am in my hiking life. I use to think that I would love to learn to lead climb. I love rock climbing out on real rock, gyms are OK, but I was introduced to rock climbing on the real thing. It is exhilirating and nothing captures the feeling of being a kid again more than this sport. Lead climbing however comes with great responsibility. Not only would I be putting my life at stake, but whoever is below me would be dependent on my abilities. I am not willing to take this kind of risk. Thursday: Poke-o-Moonshine. Considered one of the lower 54 this mountain was a perfect intro back into hiking ADK. A gentle hike 2.37 miles with a fire tower at the peak. 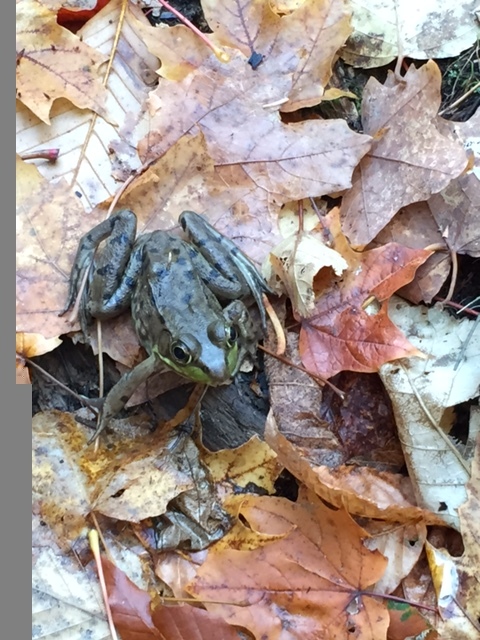 No scrambling, no rock-hopping- river-bed trail, just a great foot path with serene forest, frogs, salamanders and a few birds. By the middle of the hike, I was in short sleeves it had gotten so warm. Friday: Mt Jo. 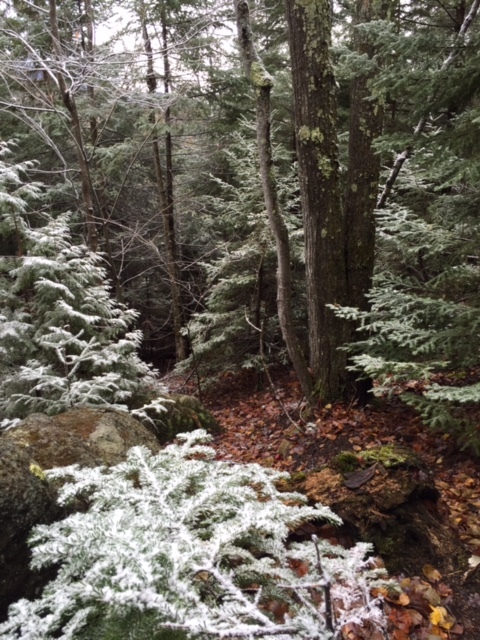 The trail was a bit wetter than Thursday’s hike, but it had snowed in the morning just enough to coat everything with a white dusting. At 2,876 feet it was a bit higher than Poke-O-Moonshine, and the last few tenths of a mile were a scramble. Summit was windy, and colder as expected, but we had our proper gear and we used all of it by the end of the hike. Saturday: A return visit to Big Crow. Always good for a “quick hike” .07 mile and 2,815′ it was a perfect end-of-stay hike. Incredibly beautiful vista at the summit makes this trail a win-win. We would laugh that the chattering birds, few that there were, were warning their families that we were on our way on the trail. It always amazes us how little wildlife we actually see when we are hiking, more wildlife passes through our backyard! Quiet time, down time, time to reflect is all so important to balance all the challenges that come our way at both work and life in general. Nothing is more humbling than standing on a summit and looking at the mountain ranges around you. It really puts things into perspective.